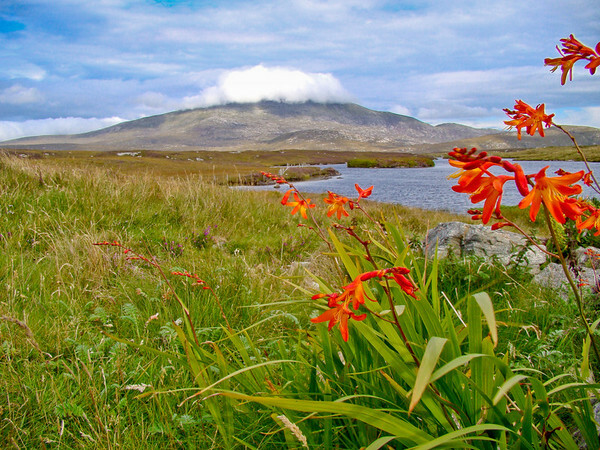 A little loch on South Uist. The mountain dominated the skyline to the east, and we spent some time looking for a spot to get off the road. (Roads on the Hebrides are one lane with passing pullouts every 1/4 mile or so. Casual stopping is not possible.) We finally found a little dirt road that lead up a hill sharply and pulled in. Scrambling out of the car and up to the brow of the hill there was the loch, totally hidden from the road, and making a wonderful foreground for the mountain. Now you do need to understand that the road lead to what amounted to an unofficial rubbish tip (as my UK friends would say), and immediately behind and below the flowers in the foreground a landscape of broken furniture and discarded household implements, various car parts, etc. took up the immediate view. I was squatting in a discarded tire to take this shot, kind of balanced on the lip of the tip, so to speak, in a vary precarious and unstable location. I had to work fast. I got off three shots from low down, trying to frame the mountain, get a bit of the loch for effect, maintain sufficient (barely) depth of field, and not get any rubbish in the view. Not easy. For this shot I used Program Shift on the H50, which allowed me to shift to my smallest aperture (only F8, unfortunately) without losing automation. As I say, the depth of field could have been a bit more, but we do what we can, and it is still a satisfying image. I gave up perfect focus on the mountain to keep the flowers sharp. Sony DSC H50 at at full wide (31mm equivalent). F8.0 @ 1/160th @ ISO 100. Programed Auto with program shift. In Lightroom, I used a graduated filter to decrease exposure and add sharpen in the sky and the upper reaches of the mountain. Fill Light pulled up the foreground. Vibrance and Clarity overall, and the global Landscape sharpen preset.